On Friday, April 26th we will take our middle and high school students to one of the hottest new indoor trampoline parks in Indianapolis. 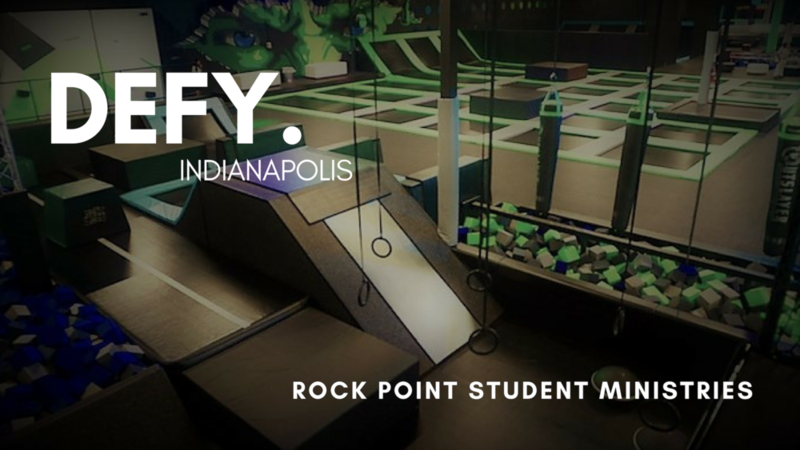 "Defy Indy" is an awesome indoor park that has tons of attractions such as foam challenge courses, trampoline dodgeball, foam jousting, foam pits, jungle gyms, and more! Please sign up online for this event - the cost is only $15 per student but they will also need about $10 for dinner beforehand. You must fill out a waiver to attend this event. The link to the online waiver is included below, so all you need to do is forward your waiver confirmation email to Danny Kolota (dkolota@rockpointministries.org), our Student Ministries Intern, upon completion. We'll leave Rock Point at 4:30pm. Hope to see you there! Please CLICK HERE to pay for Defy Indy!